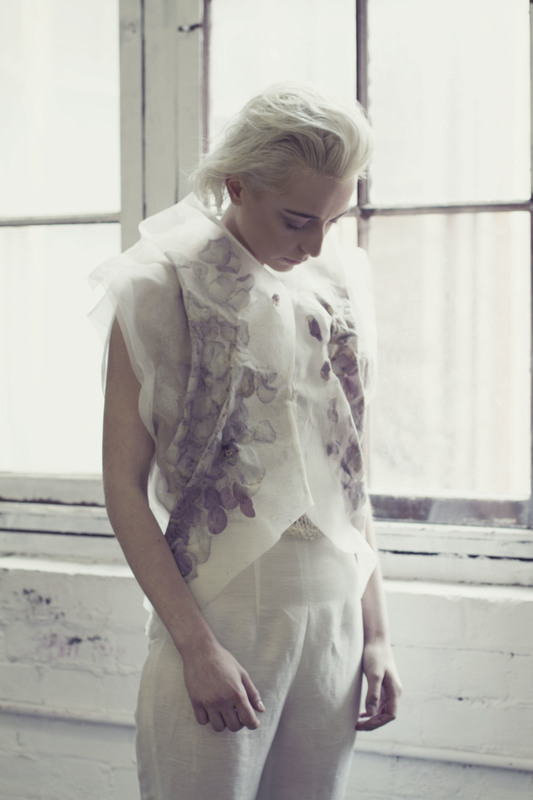 ‘Destructed Bloom’ is a reflection of the current relationship between fashion and the natural world. The aim of the collection is to highlight the importance of sustainable practice within high fashion as a means of pushing innovation ideas and creative solutions for the future of fashion. Moving beyond current visions of sustainability, ‘Destructed Bloom’ adds to this discussion, exploring different approaches to the current, failing fashion system. At its core, the collection is based around the values of the Slow Fashion movement, where by there is a return to a heightened awareness of the entire design process. Clothing becomes more about high quality materials, strong design sense and values longevity, rather than fast disposable styles, which have flooded the fashion market. Taking inspiration from readings of sustainable design practice, the textiles developed explore the idea of a cradle to cradle life cycle of our clothing. Garments are smashed and heated as a way of melding plant to cloth resulting in not only the creation of natural colour and texture but also eventual decay; the garments take on the natural lifecycle of the bloom. Having garments which are imbued with plant matter, the garment will naturally change with the lifestyle of the wearer, how its worn, where its stored become part of the garments aesthetic. While it is hoped the garment will become a valued piece of the wearer’s wardrobe, something which transcends seasonal styles and held on to, should the wearer choose to dispose of the garment, it can naturally decompose back into the earth at the end of its usefulness.